Lindsay and I headed to the course well before the race so we could enjoy the atmosphere of the event. Thousands of people were walking around, watching the day events before the Pro races would start in the evening. We both knew it was a huge event but once we were there and realized that all those people would watch the race we actually participate in, that was a thrilling feeling. My goal was that I wouldn’t be as lost as in my first crit a year ago at Tour of Washington County when I had to battle as a Cat 4 against all those Cat 1s and Cat 2s. In the staging area, a Kenda girl told us that the race consists actually of four races, the race to the staging area, the race to the corner, the race to the starting line and then the actual race….position is key in that race even for a women race. Lindsay and I ended up in the third row of three so we definitely lost the first three battles. During the call-ups Lindsay asked me if I was nervous. Showing my shaking hands said everything but there was no time to be nervous anymore because the race has started. Five seconds into the race, in the first corner a girl crashed taking a few people out. Although it was really close, I was able to get around her and started my chase to the peloton. It took me three or four laps passing about five people to bridge up to the group again. The crowd was cheering; there was no time to feel pain. Now it was a matter of holding on. I realized that some girls were not really confident in the corners and slowed down so much that created a gap and then accelerated out so much that I was not able to pass them. Also, the slight uphill on the backside definitely gave me a hard time. When I was able to pass the not-so-confident-corner-girls on a flat, they would pass me right back on that slight uphill. Once I “settled in”, I remembered that the Kenda girl from the staging area mentioned that the first 30 minutes are crazy. So once we came around through the finish line, I saw the time: 22minutes!! What???? I have only been racing for 22 minutes? Despite the shock of the time, I started to feel “comfortable” in the race (meaning I was able to drink a sip of water and was not dead last in the peloton). By that time, a lot of racers got shut out to the back. I thought Lindsay was behind me somewhere because of that first crash and I didn’t see her. Unfortunately, right when I thought I could make up some places on that slight uphill (the pace slowed down), a girl crashed two rows in front of me taking the girl ahead of me and maybe another five riders down. I had to slam the brakes big time and my back tire started sliding; however, somehow I managed to stay upright and navigated around the crash. The peloton was gone by that time and I found myself with Jen Rasmussen and another girl chasing… another painful few laps…maybe five? Then the one girl passed me and said we wont catch the peloton anymore. I didn’t really understand what she meant. She wanted to give up? No way! However, the ref pulled us out just then….bummer! Still, 35 minutes of crazy fast racing….with thousands of spectators cheering for us….it was an incredible experience! Even better, when I walked back I saw Lindsay still in the peloton. Somehow she managed to get a free lap when one of the crashes happened. She finished the race 13th! Great job, Lindsay!!! Getting ready for the Roswell crit…. Great write up! 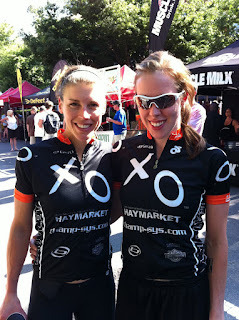 I remember seeing you race at the Walton Crit in the mens cat 4. Final Speed Week race and Jeff Cup….